If You Could Attend Any Game in Cardinals History, What Would It Be? Last night I saw this intriguing tweet from Beyond the Box Score: if you could go back and attend any game in MLB history, which game would you choose? Thought-provoking, right? Great way to spend some time pondering on a cold night. Cardinals games were the first that came to mind for me: of course Game Six of the 2011 World Series. Game Five of the 2011 NLDS. Game Six of the 2006 NLCS. Bob Gibson’s no-hitter in 1971, or his 17 strike-out performance in Game One of the 1968 World Series. The Cardinals pennant-winning game on the final day of the 1964 regular season, to cap their miraculous comeback. The doubleheader where Stan Musial hit five homers. Which leads to today’s question, which is a twist on the Beyond the Box Score’s tweet. If you could attend any game in Cardinals history, what would it be? Share your choice below — and enjoy the chance to think about the rich Cardinals tradition and history as we inch ever closer to the 2014 season. 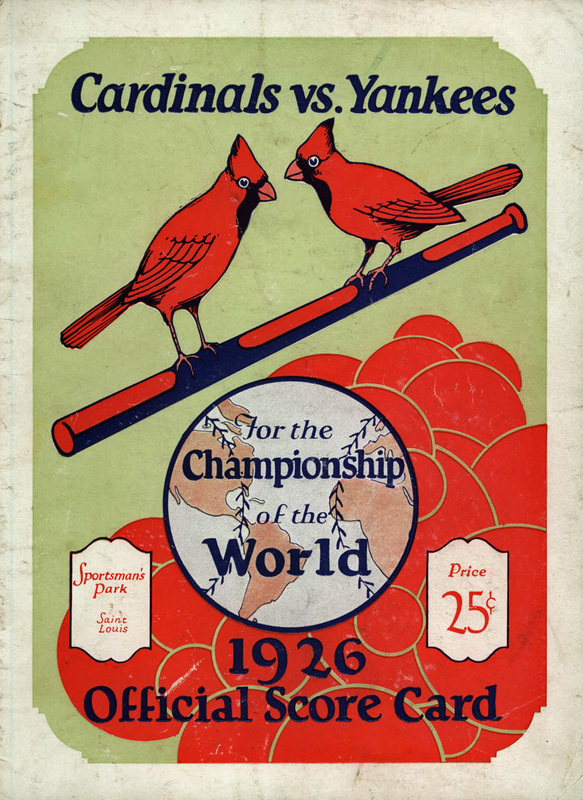 This entry was posted in General Cardinals and tagged 1926 World Series, Babe Ruth, Grover Cleveland Alexander, New York Yankees, St. Louis Cardinals by Christine Coleman. Bookmark the permalink. Easily the first one that you noted: Game 6 of the 2011 World Series. Unfortunately, I’m not very historically inclined, and thus why RetroSimba is a wonderful blog to read for me. That game is probably one of the biggest games, if not the biggest, in recent Cardinal history. I was watching it on DVD just the other day. I swear this will be unpopular but I would love to attend the Don Denkinger game.in game 6 of The 1985 World Series with the Royals. To be in that stadium at the time of that horrible call and be a part of that post game conversation, that would be amazing. Sure it’s an unfortunate game in Cards history but it is also a reminder that the Cards let that one blown call lose them that series when they came out flat in Game 7. The Gibson games are so marvelous and Game 6/2011 is the obvious(but great) pick but going back to 1985 and what could have been would be so different. The dark spots sometimes carry the best stories. I would have loved to write about it but I was only 3 years old. I could only imagine covering that series and exploring the many angles of that call. That’s an interesting choice, for sure. And it’s interesting too that so many other memorable postseason blown games — Game Six of the 1986 World Series with the Bill Buckner error, Game Six of the 2003 NLCS between the Cubs and Marlins — are, in fact, Game Sixes, meaning that the teams that blew it did have a chance to win Game Seven but none did. I’m sure, from a Rangers perspective, that’s how they look at the 2011 World Series as well. Game Six of the 1985 World Series was a little different since it wasn’t necessarily anything the Cardinals did that lost the game. But they still weren’t able to bounce back in Game Seven. Everybody forgets that! Game 7 was right there and we mentally shut down and got beat! Unfortunate. Something really to think about with the new instant replay. I may write a piece on the play that every cardinal fan would travel back in time and fix first with the new instant replay. Cool idea, but is there any play other than that one anyone would say? Ha! Beltran triple in Santana no hitter in 2012 also. It’s tough to choose. There’s the 1967 World Series Game 7 at Fenway Park with the Cardinals beating the Sawx. There’s the 1946 World Series, again, over the Sawx, with Enos’ mad dash home. There’s Jack Clark and his angry home run in Game 6 of the 1985 NLCS against the Dodgers that actually sent 17-year-old me playing hooky and watching on TV into a mad frenzy, where I ran about the house and exploded out the door to run around the year screaming my teenage fool head off. But in the end, yeah, I have to join everyone else. Game 6. 2011 World Series. Considering what was at stake and the three comebacks staged by the two teams, perhaps the greatest game of baseball ever played. Easy! Game 6 of the 2011 World Series! I agree with “Amy”! Greatest game ever played. Game 7 1982. Fun team filled with great guys to root for and ended a 15 year World Series drought. Plus 6 future Hall of Famers in that series including Whitey. That was the Series that made me a fan (as a 4 year old) watching at my Uncle’s house with the extended Cardinals family. The 1999 game that Fernando Tatis hit 2 grand slams in the same inning. My wife, my daughter and I were going to go to that game in L.A., but my wife decided she would rather go the game the following night. I have never forgiven her for that. We could have witnessed something that may never be accomplished again. Last game I ever went to with my dad before he passed was Game 7 of the 2011 series, so yeah for me to go back in time in that moment would be special. EVERY fan should be able to see their team clinch a title at home. That was an unbelievable moment.